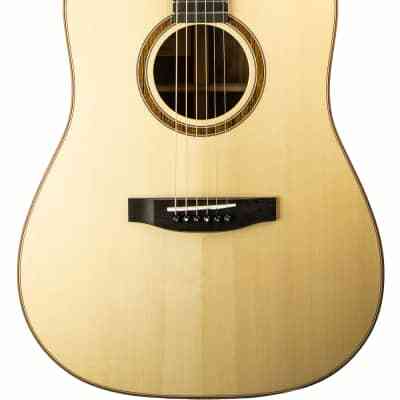 The Lakewood D-18 dreadnought acoustic guitar, has a solid european AAA spruce top with solid ovangkol back and sides. 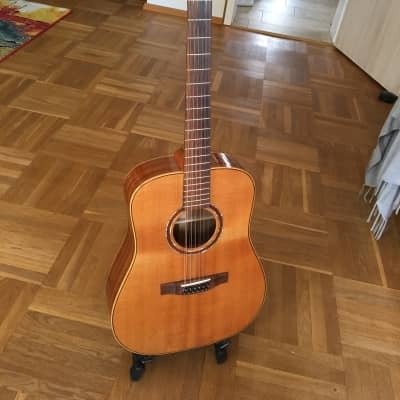 As part of the Lakewood Natural series the focus of this model is not on cosmetics (neck and headstock are unbound) but on the use of good woods finished in an natural way (grain filler is not used in the finish). Other specs include: a mahogany neck amd ebony fretboard, 20 frets, scale length 650 mm, Schaller M6 chrome tuners with rosewood buttons and nut width 44 mm. Take the LAKEWOOD D-18 price survey.